I’m enjoying the use of the new camera. I get plenty of pleasure from pretending to be an artist, and the technology behind this medium makes it rather easy. Today’s farm photo is my favorite so far, because of the mix of colors and focality [It’s fun to pretend I’ve mastered the English language, too! What is the adjetive that describes the degree of focus something has, anyway?]. I’ve decided it will be fun to participate in “Photo Friday”, too. Each week, the person behind this throws out a subject, and lots of folks take pictures on that topic and post them to their web sites. I’m in! As we move toward the creation of an American security state, the New York Times magazine asks what such a place might look like. Deep in the Mexican jungle, a joint US-Mexican government commission built a factory in 1976. Still in operation, this factory produces a single product: man-eating flies. I’m in Statesboro, Georgia for the weekend, attending the annual Georgia Organics conference. After market farming for year, I have a little bit to share with the other attendees and a whole lot more still to learn. It might surprise some to learn that I am not opposed to going to war in Iraq. There are many good reasons to do so, and if done right, both the world and the region can emerge a much better place afterward. However, I have absolutely no faith that our leaders will or can wage war rightly. Being both pro-war and anti-Bush has left me in an awkward position, with seemingly no one to cheer for and everyone to cheer against. It turns out that columnist Thomas Friedman, winner of three Pulitzer prizes, feels exactly the same way as I do. He wrote an editorial yesterday that eloquently expresses what I couldn’t here. Whatever your views, this is a piece worth reading. Johnny Cash’s cover of Nine Inch Nail’s Hurt is astounding. And the video is no less so. But then, he could sing the phone book and I’d still pay to listen. I mentioned a while back that I planned on purchasing a digital camera pretty soon. Well, I did — a Kodak DX4330. It’s quite a nice camera, and I found a bargain on eBay. So, with a camera comes pictures. I’ve added a new feature here, jointly with my farm’s webpages. You’ll find it over on the right, labelled “farm photo of the day”. It’s my intention to have one picture here each day, taken on or around the farm. And, the code behind it is php/mysql, which means that I can upload pictures well in advance and this page will display the correct one each day, automatically switching at midnight (server time). The bulk of the pages are over at the farm’s address, at www.boannsbanks.com/photolog. There, you can see the currect photo with caption, resize it according to your wishes, and browse all of the photos in the system by date, catagory, or photographer. I’m getting Chris in on this too, so you’ll get to see pictures from both of us. Back on the first of November, I told you about POPFile, an email classifier/spam filter that uses math algorithms from the 1700s. Now that three months have gone by, I thought I’d let you know how it’s worked. I can safely say that this is the best thing that has ever happened to my email. You probably know that I’ve been on the ‘net for a long time, and I’ve never shied away from putting my email address out there. This means that I get a lot of spam. A Lot. And over the years, I’ve tried every spam filter at my disposal, and none were all that satisfactory. And then along came POPFile. I’ve got quite a few email accounts, and for simplicity, they all eventually end up on the same computer. I try to have different accounts for different purposes, such as theater, farm, work, etc., but many of my friends overlap those purposes, so sorting by incoming address isn’t very reliable. POPFile handles that, too. 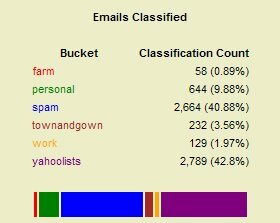 All those emails, and 41% of them were spam. That’s several thousand trash emails over the last few months wasting my resources. I’ve got my email reader automatically deleting them, so I never have to see them any more. Yay! 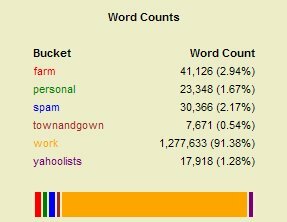 My work bucket has over a million words in it, but almost all of them are from a humongous attachment containing computer code that I accidentally fed it the first day I was using the system. The others range from about 8000 words up to 41000 words. That’s really not very many feedings. And when it gets something wrong, I correct it (using a very simple web interface), and that refines the dictionary accordingly. POPFile is platform independent and requires only that you get your email through a POP account — so it won’t work on web-based systems like Yahoo mail, for instance. To make things even simpler for windows users, there is an exe installer available that does everything but configure your email reader and set up buckets, but the step-by-step instructions will guide you from there. You might not be getting as much spam as I am (though it probably feels like it sometimes), but if you get any at all, POPFilter is worth it. It’s impossible for spammers to fool (unlike most of the other filters out there), so if enough people had systems like this in place, maybe the spammers would finally give it up. Nearly right on schedule, uncle Sam refunded our tax overpayment directly into our bank account. And on a related note, I’ve just ordered in honeybees. One thing is for certain: there is no stopping them; the mammoths will soon be here. And I, for one, welcome our new wooly overlords. I’d like to remind them as a trusted internet personality, I can be helpful in rounding up others to toil in their icy buttercup farms. Folks who recieved early morning wake-up calls from the KTEK studio might want to catch up with the voice behind those calls. Luis Perea is a refugee inside of Columbia, chased from his home by civil war. Now he tries to make a living by raising cattle and bananas while living with his family inside the ruined confines of drug lord Pablo Escobar’s abandoned ranch. Says Perea, “I guess I am like the hippos. They also came from a far place but now they are happy here.” You’ll have to read the article to see where the hippos fit in. In his speech to the UN Secutity Council today, Colin Powell briefly mentioned the Ma’dan, the Marsh Arabs of southern Iraq. These people are the direct decendants of the Sumerians, the first civilization. Do you know about them? We’ve put everything we’ve got into this pouch. We’ve searched the world over for the purest spices. We’ve accepted nothing but the freshest herbs. We’ve stirred and simmered and tasted. Until we found it. The perfect organic blend. The supreme flavor. So what’s the secret to these extraordinary recipes? Simply this: Just before we seal the pouch we add just a pinch of heart and soul. Yum. You might think that’s cheesy, but actually, it’s stroganoff.